MicroTale is an exciting 2D adventure that combines sandboxing, questing, and traditional RPG elements into one tight package! Help rebuild the lost civilizations of the MicroTale world as you gather resources, fight monsters, and build your own fully functioning airships. Cannons, drills, and other unique tiles jump in to make the gameplay even more exciting as you complete quests ranging from special combat to completing a certain number of constructions projects. NPCs and randomly generated maps add in on the fun factor, making the game unique every time you play while still offering a challenging and engaging storyline. The complete game is now available through Desura for $5.99! I know that MicroTale fans have probably become pretty disgruntled in the last few months. Despite a great launch, the first update has not been forthcoming. . . until today! Well, maybe not today today, but soon. MicroTale's first update, which should be finished sometime in either December or January, will add an all new mode of play called "Survival Arcade." In addition to adding several hours of all new fun, it will also please anyone who is looking for a better combat system and something a bit more intense in the action department. Also, it looks epic. Basically, it'll be a lot like an old fashioned arcade game. No ability to save, no rest for the weary, and no hope of actually surviving for very long at all. You'll get your resources in the day, do a little building, and then weather through a night of relentless enemy assault. I'm getting very excited about developing it! So get ready to do some serious resource gathering and shack building in the all new "Survival Arcade," coming soon to MicroTale! Visit www.jenito.com for more info. New MicroTale wallpapers available! Show some MicroTale pride and preorder for the May 1st release! An exciting 2D adventure that combines sandboxing, questing, and traditional RPG elements into one tight package! 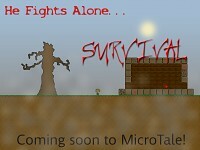 MicroTale On Desura May 1st! 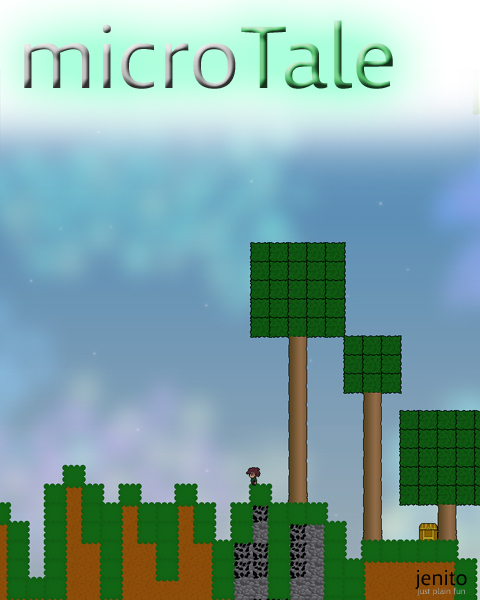 MicroTale finally gets an official release date for May 1st on Desura! Preordering starts now! MicroTale finally gets an official trailer featuring gameplay footage showing off new combat, game mechanics, and artwork! so no further updates on this? jeezus, i have GOT to stop alphafunding games. this was an alphafund thing right? i think it just went from alpha to done/got your $/see ya. seriously, this happens WAY too often. i should just be one of those bottom dwellers on the other end of the spectrum that waits till a game is out a year before buying it @ 75% off for 2.50$. It needs an update, and I'm really sorry for being so absent :( It's a one man deal, and life has been hectic these last few months. For the sake of some great alphafunded projects out there, let me clarify that this game wasn't alphafunded. I did pull a cya, but maybe I can pull a comeback too :) Game was free in Alpha/Beta. huh, i paid the 5.99 for it. it must have looked like it was going somewhere. u ever updateing this yo?